You know what I’m talking about . . . coffee! Mmmm, the smell, the taste. Coffee is a salve to our souls. It gives us a boost every day we’re tired or struggling . . . and every day in between. On Sundays we sing passionately about how Jesus satisfies our every need. But even a casual reading of our social media posts tells a different story: We declare our true love for all the things we use to fill our innermost emptiness. There’s a distinct difference between what we say we love and what we actually love. Instead of listening to your words, watch your actions. When you feel down, where do you turn? There is your savior. What do you spend your time thinking about and pursuing? There is your lord. I can hear you now, “C’mon, lighten up, Justin. It’s just [coffee].” For me, it’s “just” Mountain Dew. That sugary blast of liquid energy often picks me right back up when I’m feeling down. I “do the Dew.” What do you do? As I have heavy conversations with my pastor friends and reflect on my own struggles, I’m struck by three areas of a disciple’s life that need our attention. First, the depth of our brokenness is profound. We must “watch [our] life and doctrine closely” (1 Timothy 4:16) because living in the world often means a bit of the world gets into us. We’re prone to wander from His paths. Living as a disciple precedes and must always take priority over making disciples. The life of a disciple is one of perseverance. The solution to loving things in the world isn’t knowing more about the gospel. What we need is more wisdom on how to unleash the gospel into our brokenness. If we don’t, then we quickly run back to the world’s ways of soothing the soul’s needs. Second, we need to wage war on the things that compete for Jesus’ place as our Savior. It’s not that coffee, Mountain Dew, shopping, or the like are sinful in themselves, but if we find ourselves moving toward them for life, they become idols. The sad truth is that many of us matter-of-factly proclaim our dependence on/need for/addiction to many things that aren’t Jesus. As Paul said, “‘Everything is permissible for me,’ but not everything is beneficial. . . . I will not be mastered by anything” (1 Corinthians 6:12 CSB). We are mastered by things we can’t let go of. And being mastered by anything other than the Master isn’t okay for a disciple. If the Lord is my portion, then I must wait for Him to fill what’s lacking in me. As I experience fear, disappointment, relational pain, brokenness, or grief, I lean into the truth that He is my portion. Life is found in Him, not in coffee, a Mountain Dew can, or anything other than Him. This is discipleship: the process of becoming like Him. Day by day, taking up our cross by wading into deep uncomfortable waters, denying ourselves the easy fix, and pursuing Him as our Savior. Not just when we feel like He’s worthy, but moment by moment, even when we experience internal pain. It’s in these habits that the life of a disciple becomes powerful and takes on a quality that others can experience as they know who we are, not only what we believe. Those close to us can see both our struggle and our process of renewal. Read through the verses referenced above as you prayerfully consider your own life as a disciple and disciplemaker. 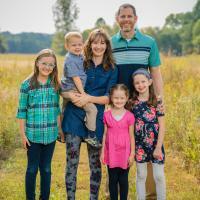 Justin Gravitt of Dayton, Ohio, is an Area Director for Navigators Church Ministries. Read more about him and from him at his website, One Disciple to Another, where the above article first appeared. I agree with this analysis of the insipid place the stimulant drug caffeine occupies in the lives of many Christians. I saw a sticker on a car that read “I love coffee and Jesus” – I didn’t take that as ironic humor. I’m curious to see what kind of pushback from Christians Justin Gravitt will get for this piece. Or maybe he’ll just hear crickets. I see now the article was written by both Justin and Kristen Gravitt. I’m sorry for neglecting to mention Kristen in my comments. Thank you for this. I am 66 years old but can still fail so much in idolatries. Patiently waiting on God is what speaks to me today. PS how to Navs work in church ministries? I need and lead a group of men with sexual brokenness in Celebrate Recovery. I will be using this tonight as our devotional. There are so many principles that overlap in recovery and discipleship! Amen and amen, as I am leaning on the Lord this lent, and less on caffeine, your words are timely and inspired by the divine. Thank you and Praise the Lord! The one thing that keeps me going is God, Himself. If I keep my eyes glued on Him, then He shines brightly to me. Even when my emotions are pulling me in the other direction, I always sense His persistent and loving hand gently leading me back to Himself. And it is for me to de-throne the old and rebellious me, and put Him back on the throne of my life that is rightfully His. “Living as a disciple precedes and must always take priority over making disciples.”, what a great thought. Thank you for showing me how my “idols” can invade my life without me knowing it. My memory verse for last week was Lamentation 3:22-23, how fitting that is. Thank you.